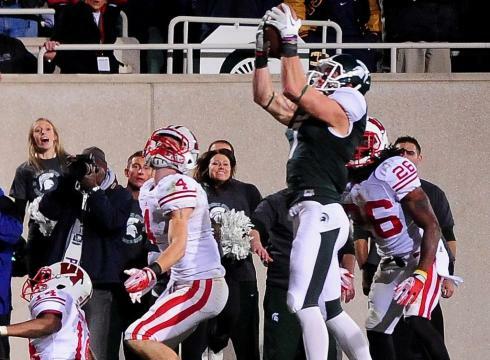 This picture will be shown for a while around the Big Ten. Gameday got it right this time around. The Bucky – Huskers game had all the hype about a month ago with Fowler’s crew roaming the streets in Mad-town. But that was a terribly disappointing game in terms of sheer entertainment value. Four weeks later, Gameday ventured out to Big Ten country again and this time NOBODY was upset about the way the game finished. Obviously Bucky fans weren’t too happy about the outcome but the game was legendary. Big Ten Network will show the heck out of this game for years to come. The game had everything … or did it?? One can only hope that this channel will come around someday. AH: Lots of options here. But the designation has to go to a team from Michigan at this point. Which one of the two? Sparty. Why Michigan State? Because they are only one victory from being undefeated in the conference with their lone loss on the season against Notre Dame. They get it done with defense and turnovers. Kirk Cousins was somewhat overlooked in the Big 10 after a decent 2010 and isn’t doing anything to hurt the Spartans. But the defense is bringing it and ranks first in the conference in points against and seventh in the country. With games against Minnesota, Iowa, Purdue and Northwestern to end the year, their season comes to the matchup with Nebraska this week.